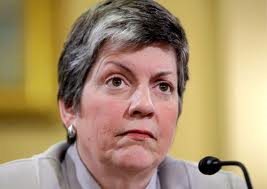 Janet Napolitano, the U.S. Secretary of Homeland Security is resigning. According to accounts, she is going to resign Friday and become the next president of the University of California system. Well that was rather sudden. Napolitano will become the first woman in its 145-year history to hold the post. Janet Napolitano has served as the leader of President Barack Obama’s homeland security division since his first inauguration in 2009. I want to thank Secretary Napolitano for her outstanding work on behalf of the American people over the last four years. At the Department of Homeland Security, Janet’s portfolio has included some of the toughest challenges facing our country. She’s worked around the clock to respond to natural disasters, from the Joplin tornado to Hurricane Sandy, helping Americans recover and rebuild. Since day one, Janet has led my administration’s effort to secure our borders, deploying a historic number of resources, while also taking steps to make our immigration system fairer and more consistent with our values. And the American people are safer and more secure thanks to Janet’s leadership in protecting our homeland against terrorist attacks. I’ve come to rely on Janet’s judgment and advice, but I’ve also come to value her friendship. And as she begins a new chapter in a remarkable career of public service, I wish her the best of luck. First Arizona Jan Governor responds to the US Supreme Court ‘s ruling on Arizona’s Immigration Law S.S. 1070, then 3 hours later Brewer and the citizens of Arizona were presented with the Obama White House and Homeland’s Security’s vindictive reprisal. Homeland Security and Janet Napalitano suspended the seven 287(g) task force agreements with Arizona law enforcement officials. No sooner did the SCOTUS make their decision and the Obama Administration attacked in only the vindictive nature that they know how suspended the 287(g) agreements with Arizona that allowed state and federal authorities to work together in battling illegal immigration. Wow, the Obama Administration just declared war on Arizona. Feds set up a hotline for people to nark on the state officials for so-called civil rights violations. This is the equivalence to a ‘wanted poster’ for state authorities doing their job as voted unanimously bt the SCOTUS. What on earth is going on? Following the Supreme Court decision about Arizona’s immigration law, Greta Van Susteren spoke with Arizona Governor Jan Brewer, who wasn’t sky in holding back her feelings about the decision. Brewer — who you may recall had a brief, finger-wagging encounter with President Obama — criticized the current administration for abandoning Arizona, and not letting her protect her state’s citizens. It is obvious that Barack Obama must go. No one will be able to deal with a President who will not enforce the rule of law in America when he decides as a King that he does not want to. It is impossible to deal with the obstruction of the Obama Administration and Attorney general Eric Holder with regards to ‘Fast and Furious’ and now when they do not get their way, they try and punish a state. There must be comprehensive immigration reform in the US; however, Obama is hardly the honest broker to have as President to ever attempt such a change. Obama changed immigration law last week by executive fiat in stating that only a certain group of people will be granted amnesty. Even though he had previously stated he did not have the authority. Barack Obama can kiss the state of Arizona goodbye in the 2012 Presidential election. Brewer also criticized the policy shift in an interview with John King of CNN. 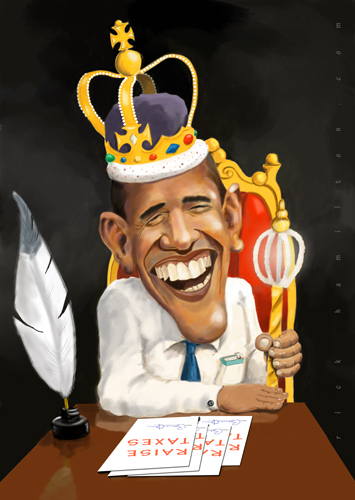 Talk about vindictive … Once again King Obama speaks and disregards the US Constitution, the US Supreme Court and his Oath of office … How’s that “hopey, changey” thing working out for you America? In yet another act of Executive defiance, Barack Obama’s Homeland Security suspends Immigration agreements with Arizona police over enforcement of federal immigration laws. They have issued a a directive telling federal authorities to decline many of the calls reporting cases of illegal immigration. The following is an act of a sore loser President. On Monday the administration officials also said they are ending the seven 287(g) task force agreements with Arizona law enforcement officials, which proactively had granted some local police the powers to enforce immigration laws. UNREAL. So much for the rule of law and separation of powers. We have a President who thinks he is King. The Lonely Conservative says, why should we be surprised by the actions of the Obama Administration. If this is how they act, when the SCOTUS rules, could you imagine what Obama and his henchman will do of the Court strikes down Obamacare? So this is what you get when you dare go against Barack Obama, you wind up on his enemies list. As stated at the PJ Tatler, This is a political maneuver designed to punish Arizona. Barack Obama congratulates the Muslim Brotherhood on their victory in the Egyptian Presidency, yet attack a US State and tries to make an example out of them because they dare defy der Obama on enforcing illegal immigration. Obama must be voted out in 2012, can you only imagine the disregard of the people and the US Constitution with a lame duck President? It also tells us that the administration has given up on winning Arizona, which until recently was considered a swing state, this fall. Obama has written it off, and is now going Soviet on it to make it an example to others. He is essentially kicking Arizona out of whatever is left of the federal government’s border enforcement, declaring to smugglers and traffickers that Arizona is very much on its own. How disturbing and irresponsible … Welcome to the Hope and Change that Barack Obama promised. The FBI warned Monday that anti-government extremists opposed to taxes and regulations pose a growing threat to local law enforcement officers in the United States. Hmm, just who are they pointing at? It sounds an awful lot like the Tea Party doesn’t it? Remember when Home Land Security (HLS) Janet Napolitano disgracefully called Military Vets are Right Wing Extremists? The FBI would target concerned citizens doing their duty to question their government and actually want responsible spending and taxes as opposed to an Occupy Wall Street protect movement that has promoted anarchy and violence. Who are the ones assaulting police officers? Oh yea, and #OWS has such kind things to say about local law enforcement. Sick indeed. 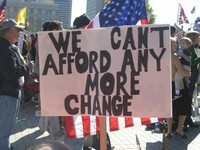 Welcome America to the “Hope & Change” you were promised. Homeland Security Secretary Janet Napolitano visits Afghanistan in an attempt to find new ways to establish a border security and customs system to counter terrorism while allowing legitimate travel and trade. WHAT!!! This from the same person who refuses to secure the US – Mexican border? Are you joking, this is like a bad SNL skit. 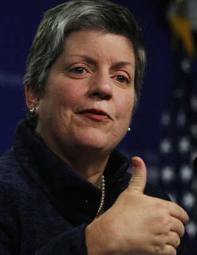 Question, what will Napolitano call the terrorist that sneak across the Afghan-Pakistan border … undocumented Jihadists? How can any one take this serious? Napolitano and her cronies are supposed to affect Afghan border security when right under her very nose in the United States she has failed miderably to secure let alone address the issue of the border. Just ask the family of deceased border agent Brian Terry whether Napolitano is doing a good job at securing the border? We have an Obama Administration that is more concerned with going after Arizona and their efforts to protect their citizens than they do securing the border. Now they are going to show their expertise in Afghanistan. I feel confident. Unconfirmed reports states that terrorist in Pakistan were wetting them self with laughter. Six Department of Homeland Security (DHS) customs and border security officials will accompany Napolitano on the weeklong trip, which will include stops in Qatar, Israel and Belgium. Napolitano spent Friday morning touring Afghanistan’s Torkham Border Crossing with Pakistan and meeting with Afghan an U.S. border security and customs officials to find new ways to establish a border-security and customs system to counter terrorism while allowing legitimate travel and trade.